This dish is similar to the Thai Green Curry Shrimp with Noodles dish we made last summer, and it is equally satisfying. It hit the spot upon returning from the gym- not too heavy and not too light. Fresh and packed with spices, this Thai Shrimp curry dish was the perfect meal on a unseasonably warm March evening. I said it before, and I will say it again, “Move over Baan Thai. There’s a new Thai cook in town.” I am thankful he lives with me! Heat peanut oil in heavy large skillet over medium-high heat. Add sliced onion; stir-fry until soft and beginning to brown, about 4 minutes. Reduce heat to medium. Add green onions and curry paste; stir until fragrant, about 1 minute. Add coconut milk, chicken broth, fish sauce, and sugar; bring to boil. Add tomatoes and boil 2 minutes. Add shrimp and cook just until opaque in center, stirring often, about 3 minutes. Boil the water and add vermicelli. Cook until tender, about 6 minutes. Transfer noodles to large shallow bowl and top with curry. 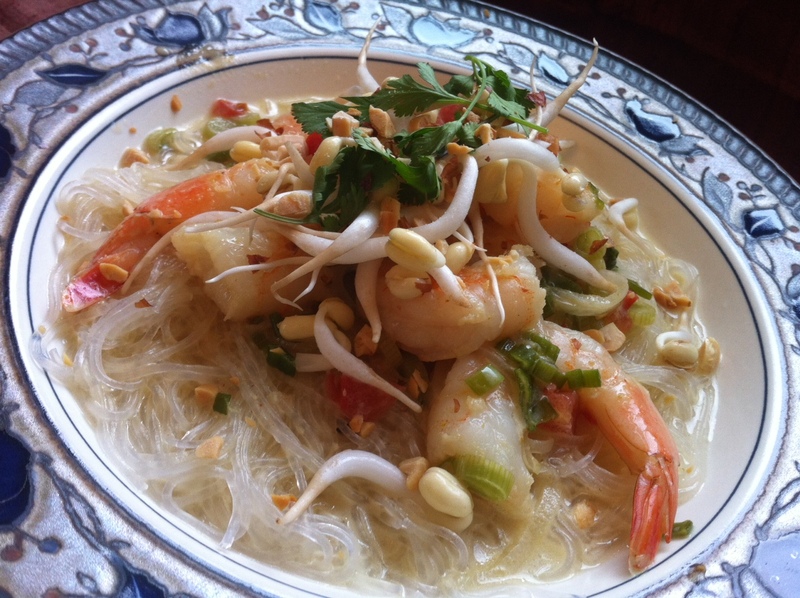 Garnish with cilantro, bean sprouts and peanuts. Serve, passing lime wedges separately. *Available at Asian markets and in the Asian foods section of some supermarkets. Where are you getting your green curry paste? I haven’t found a good store brand that compares to Baan’ies yet and was wondering if you had any suggestions. I have tried “Thai Kitchen” curry and it isn’t spicey enough for my taste, and it lacks in something else that I can’t quite put my finger on. As I am a tad intimidated to make my own yet (one day I will… one day) I am just curious if you have found one that I haven’t yet tried. Thanks for sharing! Your noodles with the thai shrimp curry looks beautiful and must taste great. Thanks Karen. It really is a delicious dish.